Supervisory Board – the ultimate decision-making body of the consortium. The board consists of one representative from top-level management of each partner institution. Steering Committee - the supervisory body for the execution and operation of the infrastructure. It reports to the supervisory board. The Committee ensures regular flow of information about overall status of infrastructure development, future planning, and administration of the consortium. 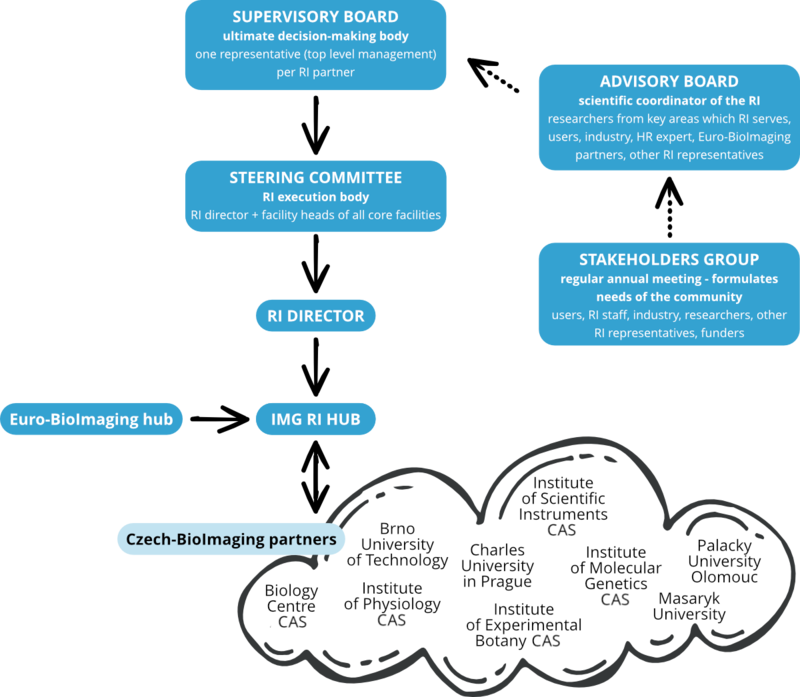 The committee consists of facility heads (Czech-BioImaging nodes) from each partner institution. Advisory Board - it advises on the operation and development of the infrastructure, on the broad scientific matters, reviews the research programs and plans, and suggests improvements. It consists of researchers representing the key research areas the Czech-BioImaging aims to serve and key external users, industry, human resources expert, Euro-BioImaging partners.